Have ya’ll seen this pin? I chuckle every time I see it. Today I had one of those lessons where it could not have gone better. We had just gotten back from a few days off for Easter and I wanted to revisit how and why and what we can write about. I read aloud the story Rocket Writes a Story…. …and Rocket took it from there. The book is amazing. It encourages students to love words as Rocket goes through the beginning of the story collecting words he loves. Then he decides that he is going to write a story. I don’t want to give too much of the book away but Rocket begins to write his story and adds new things to it every day. He uses descriptive words and similes and writes a beautiful story about friendship that had my first graders awe-ing by the end of it. After we read the book, I asked my students what Rocket taught them and reminded them about writing. They came up with some amazing ideas. We did a quick mini lesson on using descriptive words to “paint a picture in your reader’s mind” and then I presented my question to them. I usually end my writing mini lessons with a question for my students to think about and I have my students think of an idea before they leave our carpet so they can get right to work. If they get an idea they put their hand above their head and open their fingers up wide and mouth the word “lightbulb” to me. (It’s corny I know but my first graders love it. It also makes me giggle on the inside because I think of Despicable Me when he says, “Liiiiiiiiightbulb” hehehe ) I then nod to them and they go off to write. If my students can’t come up with an idea I send them to our “idea chart.” This hot ticket (which we refer to every.stinkin.day ) was seriously one of the best purchases I ever made from TpT. My friend Lori from Teaching with Love and Laughter made this and I swear it has been a life saver. The packet that I bought has a BUNCH of topics that students can use when they are writing. In fact, what you can’t see is that I have two pocket charts right next to each other in my room at kid level so they can go up to it and take a card to their desk to write. So, my kids who didn’t have an inspiration, went and got inspired, and then wrote for 20 minutes. I turned down the lights and played some quiet working music and the kids WENT FOR IT today. After they wrote, two of my kids shared their fabulous stories. After each friend read, (and we applauded) I re-read their story and stopped occasionally to ask my listeners what they were seeing in their heads. For example, one of my boys had written a story about a race car that was driving too fast and it crashed. (He is obsessed with Nascar and racing cars) I stopped and asked, “what color is the car you are picturing in your heads?” I got: red, blue with a yellow stripe, green with rockets, etc. I asked the author and he said, “actually it’s rainbow striped and it has giant rockets on its tail lights.” (who would have guessed that, right?) I asked my students what are some of the things they wish ______ had told us? They told him they wished he told them what color the car was and how it crashed. So, I wrote in his journal, (on the opposite side of where he wrote.) Dear _______, This is a fantastic story. We enjoyed listening to it! What color is the car you are writing about? How did the car crash? Thanks so much for sharing. Then two of my students gave him a compliment and he picked the next friend to share. It was really neat for the kids to generate the questions and give heart felt compliments. After those lessons, my students will add to their stories from today. I’m looking forward to their great stories! In closing, I totally felt today deserved a #nailed it. 🙂 I hope you’re having a good week! Wow! They certainly did nail it! What an inspiring post! Thanks for the shout-out and thanks for sharing your cute stories. Today, I had a kindergartner refer to the writing topics chart and choose the sweet treat card. Then, she wrote this adorable story about loving cupcakes with colored sprinkles on top. She went from not knowing what to write, to writing an adorable story with a tasty illustration. Can’t ask for anything more than that! Thanks again! You did deserve a “nailed it”!!! Love all of your ideas! We did the geode egg science experiment and it was amazing! The kiddos were in awe! Looks like they really enjoyed the writing, wow! Awesome post. I just love teaching writing. And your tips are an awesome refresher. 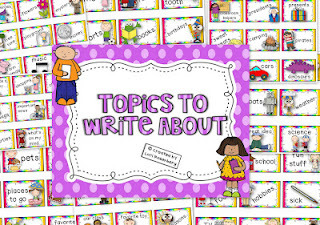 I’m definitely adding the Writing Topics to my TPT wish list. 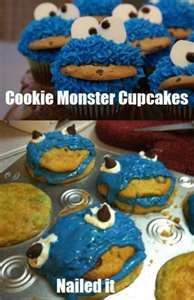 I’ve never seen that cookie monster picture, but it totally made me LOL. That is so me when it comes to crafty stuff! Thanks for sharing! Love that nailed it Pinterest find. So funny! I really do need that book! It looks amazing! I love the lightbulb thing! Despicable Me is all I can think of now! Such a cute movie!